The Government of the Central African Republic sign a peace deal with 14 rebel groups. 2018-12-20 The annual Thomson Reuters poll among aid agencies shows that the situation in the Democratic Republic of the Congo, with its war, hunger and Ebola outbreak, is perceived as the most neglected crisis of 2018. 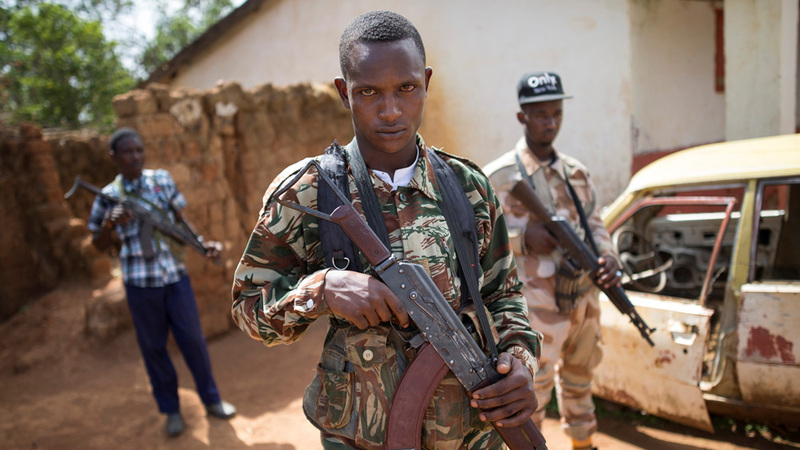 The Central African Republic, with its civil war, is a close second. 2015-11-29 Pope Francis arrives in the Central African Republic, the last stop of his six-day African tour, becoming the first modern pope to enter an active war zone as the country is in a state of civil war. 2015-11-13 At least 22 people are killed this week in a string of raids on villages in the Central African Republic. The escalation of violence threatens to derail a visit by Pope Francis and crucial elections scheduled for December 27, 2015. 2019-01-25 18 people were killed and 23 others were injured when gunmen belonging to the "Union for Peace" group, attacked a funeral ceremony in the town of Ippy, Central African Republic. 2018-07-31 Three people are killed and robbed in an ambush near Sibut, Central African Republic. The Mikhail Khodorkovsky-financed "Investigations Management Center" says that they were Russian journalists who worked with them on a documentary about Wagner Group mercenaries and Russian mining interests in the country.